Welcome back for another Team Stryker Thursday! 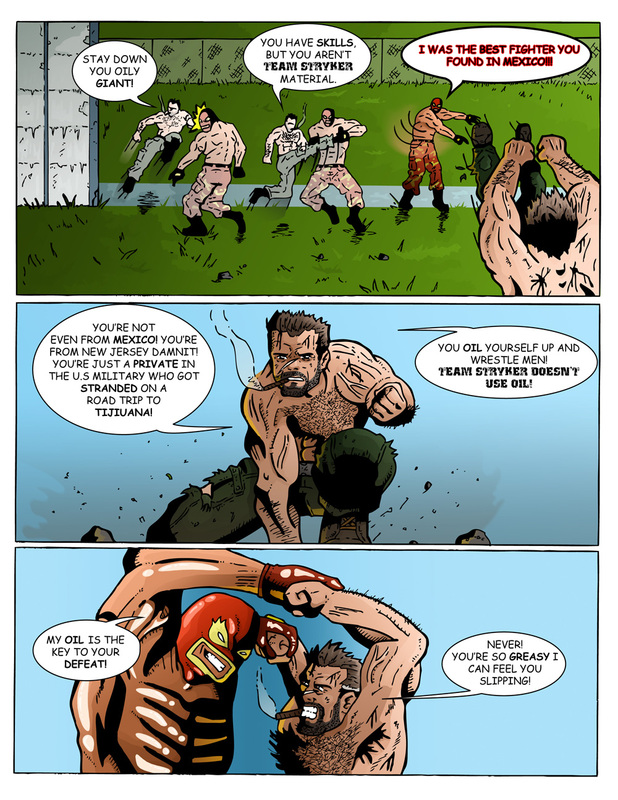 We are closely reaching the climax of the first Mission of Team Stryker with Page 09. This first Mission is half the size of a standard published comic book and that is only because it was done on an EXTREME deadline as my friend Matt (the inspiration for Eagleheart) was getting married and I had to make sure it was finished before the wedding. I managed to successfully deliver the comic as well as his and hers Team Stryker’s t-shirts for the wedding and to top it off I put them in the biggest Optimus Prime gift bag I could find. My gift really stood out compared to all the more conservative ones that’s for sure. The next Mission will be over twice as long as runs in at 25 pages plus a cover so you are in for 13 weeks of pure mind-blowing awesomeness when that starts up in July. In other Team Stryker news I am still awaiting my first printed copy of Mission 001 in the mail. According to the tracking system it went from Orlando on June 7 to Miami on June 10 and now it’s just kind of…sitting there. I’m hoping that the tracking system is just being lazy and that my comic hasn’t been hanging out in Miami for 11 days just getting a tan. As soon as I receive this prototype issue then I can put it online for retail hopefully to coincide with Mission 001 wrapping up and Mission 002 starting up. I’m also looking into doing online distribution for those of you would want Team Stryker on the go without the burden of having to check the site 13 times. In non Team Stryker related news I am dangerously close to loosing my mind as the complex I live in has had power window washing going on for the last two days right outside my office window. For 9 hours yesterday starting at 8am (I was up until 2am the night before working) and then again this morning it sounds like there is a loud lawn mower constantly going outside the back my house. But here is the kicker: the lawn mower doesn’t move away, it just stays parked outside my house for 9 hours. When I finally couldn’t take it anymore and went to the front of my house to BBQ some lunch there was an actual lawn mower going around. I ended up walking to the nearest Safeway just to get away from the chaos that was my neighborhood. The next time they show up I am going fishing. Enjoy the rest of your week and I will see you all back here on Monday! I’m surprised you don’t have any comments, Andrew. This comic is over-the-top funny! You should have tons of comments! My comic is just beginning and I have lots of comments. What I do is go to other webcomics I enjoy reading and leave comments. Sometimes the artist will reply and sometimes not. I can’t understand why an artist would not reply to a comment from a fan. But it happens! I reply to every comment written. The way I see it, a reader is taking their valuable time reading and commenting on my site when they can easily watch a movie, play video games, go on FB or read other webcomics. I value each and every comment. To me that’s gold! So I make the effort to show my appreciation for their time and energy with a reply. Also, this encourages other people to chime in that otherwise wouldn’t know what to write or say. Sometimes, I have readers just write, “Hello” and that’s it. I still reply because there’s a chance that they’ll open up in the future and comment more. Anyway, usually they will follow my link back to my site and leave a comment there, too. I will reply and then we read and comment on each others’ sites all the time. It helps both artists because other readers will click on the links and discover their site. Also, are you in Ink Outbreak? If not, you should be. I know this was long winded and preachy but I really dig your comic, Andrew, and I want it to succeed. This should be your only job! That’s how I feel about the Wacky Monkeys. I don’t want to do anything else besides that. Hopefully this was helpful info for you. I know! I have no idea how to get people to stop and say “hi” in the comments section. I talk to tons of amazing people on Twitter and Facebook it but getting them write in the comment section is a little harder I suppose. Thank you for all of your comments. Reading and replying to all of them has been the highlight of my day! Would you go to a restaurant that has no customers, empty tables and parking lot or would you rather eat in one that has cars in the lot, plenty of people going in and out and tables full? That’s what the comment section is to webcomics. 1) You must get this slow loading problem fixed. It’s a real chore to wait a minute before it loads. 2) Comment on other webcomic sites. If you’ll look at my comments section, those guys will definitely comment on your site if you comment on theirs. They are a really great group of ‘toonists! We are very supportive of each other. And they are so witty and funny to read and learn from! 3) Get a Gravatar with a pic of EagleHeart or something interesting that will catch other people’s attention and compel them to click it and follow the link to your site. Right now your avatar is blank! I get lots of clicks to my site due to my monkey avatar. I know that because in my stats it shows how many clicks I get from Gravatar. 4) Get a plugin that will put a little check box under the comments that will give the reader the option to receive notification of a reply by email. In other words, they’ll get an email when you reply to their comment. The chances are great that they’ll come back to comment again. Right now, you don’t have that option available and I didn’t know that you had received and replied to my comments. If I think of anything else I’ll let you know. Hope this helps, Andrew. BTW, I liked the interview you did with the Wombmates. I got an interview lined up with Kurt Sasso at TGT Media on the 13th so wish me luck! Thanks Milo! It’s hard for me to go back to these old issues since I’ve come a long way since I drew them but I’m glad you’re enjoying your first Team Stryker experience!